The 5D3 16TB 5-Bay Thunderbolt 3 Array (Gold Edition) from Drobo improves upon the original 5D3 by pairing it with 4 x 4TB hard drives for a total capacity of 16TB, a 128GB mSATA SSD, and five years of DroboCare warranty services. The 128GB mSATA SSD is installed into the unit's Accelerator Bay and boosts system performance by placing data that is read or written into SSD storage. When the data is active, it is stored in the SSD and will be moved back to the hard drive tier as its use decreases. Upon product registration, the extended five-year DroboCare warranty provides hardware replacement, technical support, and migration assistance. Drobo has designed the 5D3 for media professionals, content creators, and small businesses running Apple Final Cut Pro, Adobe Lightroom, and other I/O intensive applications, or even those who just need to back up terabytes of data. It is equipped with five 3.5" SATA drive bays that support 3.5/2.5" SATA III 6 Gb/s and SATA II 3 Gb/s hard drives and SSDs. The 5D3 distinguishes itself from the original Drobo 5D and 5Dt through the inclusion of Thunderbolt 3 technology, which is accessed through two integrated Thunderbolt 3 ports. While one of the Thunderbolt 3 ports is used to connect the 5D3 to your compatible system, the second one is used to daisy-chain up to six Thunderbolt devices together, including one 5K display or two 4K displays. The Thunderbolt 3 ports also provide 15W of charging power for Thunderbolt 3 laptops, and there is also one USB 3.0 Type-C port, which transfers data at speeds up to 5 Gb/s. Please be aware that the 5D3's Thunderbolt 3 ports are only compatible with Mac, while the USB 3.0 Type-C port can be used with both Windows and Mac. Mac support includes APFS/macOS High Sierra. To facilitate data protection, Drobo's BeyondRAID technology enables single- or dual-drive redundancy. If there are any empty drive bays, BeyondRAID allows additional drives to be inserted into the array, where they would be automatically configured. If all drive bays are occupied, simply replace the smallest capacity drive with a larger one and BeyondRAID will handle the rest. BeyondRAID is also what allows drives of varying capacities to work in the same unit, which helps enable future expansion as larger drives become available. Additional data protection is provided by the included rechargeable battery, which helps protect data stored in the 5D3's cache. If there were to be a sudden power loss, the battery allows the Drobo to stay powered long enough for the cached data to be written to non-volatile storage. Cooling is provided by a 120mm variable-speed fan and once installed, the hard drives can be configured to spin down when they're not in use, helping to further reduce noise and energy. Also, the LEDs can be dimmed to reduce light pollution when working in sensitive environments. The Drobo 5D3 also includes a 3.3' Thunderbolt 3 cable and a 6.0' power cord with a power supply that operates using 100-240 VAC at 50-60 Hz. The supported operating systems are macOS 10.12 and higher, plus Windows 8 and 10. The Drobo 5D3 is equipped with dual Thunderbolt 3 ports for daisy chaining on Mac only. Connect up to six Thunderbolt devices and/or a non-Thunderbolt monitor at the end of the chain. The 5D3 supports one 5K monitor, or two 4K monitors, and 15W of power for device charging. By having 5D3 arrays in a chain, you can have up to 300TB of usable capacity and achieve throughput by enabling the bi-directional 40 Gb/s performance of Thunderbolt 3. It is compatible with systems running supported versions of macOS X, including APFS/macOS High Sierra, as well as Windows, with Windows compatibility only available using the USB 3.0 Type-C port. The Drobo 5D3 includes a built-in Accelerator Bay, with a 128GB mSATA SSD. Their patented Accelerator Cache technology keeps a copy of your most frequently accessed data to deliver fast speeds. The accelerator cache can dramatically speed up loading large photo libraries and other I/O intensive operations, smoothing out workflows allowing you to optimize productivity for applications such as Apple Final Cut Pro X and Adobe Lightroom. Drobo Dashboard is the single tool used to centrally manage all of your Drobo devices. Drobo Dashboard displays status as if all of your Drobos were right in front of you with the same status lights and capacity gauge that are on the front panel. All administration tasks are a single click away. DroboCare extends beyond the standard hardware warranty, providing you with additional peace of mind. 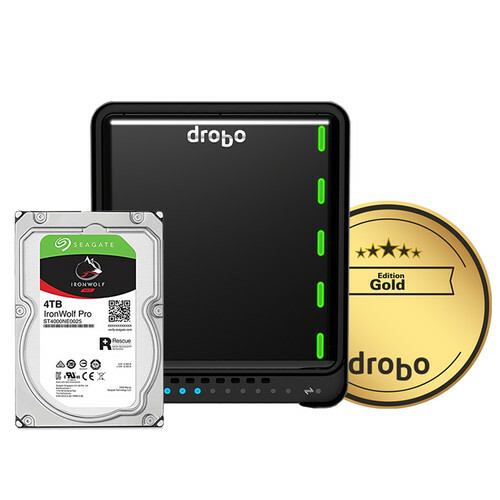 If an issue occurs, Drobo will immediately send you a replacement Drobo and pay for shipping both ways. Phone support is also available 24/7, beginning the day you activate DroboCare. In addition to hardware replacement and technical support, DroboCare also includes migration assistance. Please note that DroboCare does not cover failed hard drives.